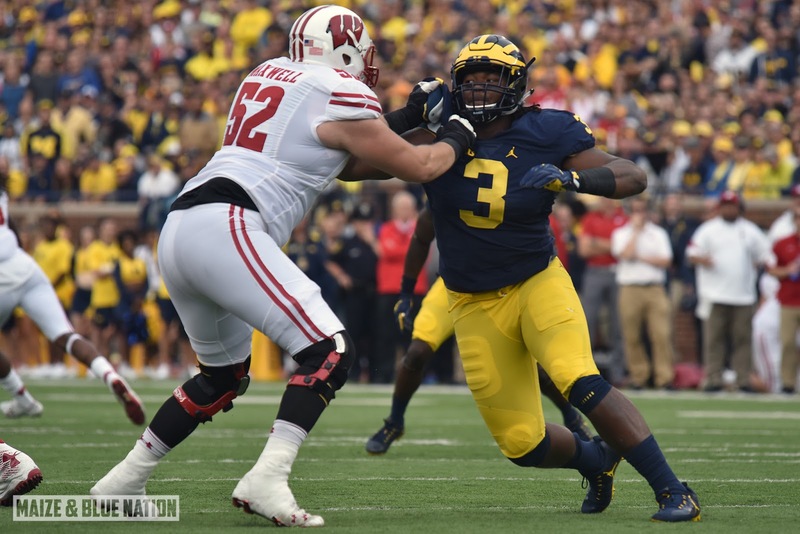 For the last two weeks since Michigan traveled to New Jersey to take on a Rutgers football team that looked like they might have trouble handling some of the local high school teams, members of the college football media have been snarkily stating that it would have been more productive for Michigan to scrimmage itself rather than make the 600 mile journey east. If you yourself are in that camp, you probably won't bother to tune in (at least not for all four quarters) Saturday for what will surely be more of the same when Illinois saunters into the Big House. But if you're like me, and you love watching a Michigan team firing on all cylinders, dismantle and humiliate lesser opponents, then Saturday afternoon should be filled with high fives and Ric Flairs... Or whatever it is you do when you're in your football happy place. But regardless of your current level of interest in the matchup, I'm here to break down this preview for yous guys, and that's what I'm gon do. To say that the Illini offense is struggling to find an identity would be an understatement. Their first string quarterback, Wes Lunt is questionable for Saturday with back issues. His numbers through five games aren't exactly great, but they're not terrible either. He's 78 for 129 with 1 INT and 6 TDs. Which tells me that he can throw an accurate ball, but the offense has trouble putting together drives and getting into the end zone. Further evidence to support that claim comes with the fact that their field goal kicker, Chase McLaughlin is responsible for more points (44) than any other offensive player. First year offensive coordinator, Garrick McGee has had success at other programs, most notably Arkansas. He favors a run first approach, and like the Michigan offense, rotates a handful of backs in his rushing attack. Leading the committee is Kendrick Foster (392 yards on 62 carries, 6.2 avg., 5 TDs), but this group of backs has not seen a front seven anywhere close to the talent level of Michigan's, and it will almost certainly be an extremely long afternoon for them and the rest of the Illini offense once again. Head Coach Lovie Smith in his first season at Illinois, brings a wealth of experience to the position, particularly on the defensive side of the ball. I have full confidence that he will be able to turn the Illini football program around, if given enough time to do so. But the fact of the matter remains that he found a cupboard mostly bare upon arriving in Champaign. He does however have a handful of talented players on defense who are making respectable contributions. Linebacker, Hardy Nickerson leads the team in tackles with 58, and comes from NFL pedigree with father, Hardy Nickerson Sr. having played 16 seasons in the league. The defensive line features two very capable defensive ends in, Dawuane Smoot and Carroll Phillips, who've combined for 19 TFLs and 5 sacks. The secondary standout is nickleback, Darius Mosely (21 tackles, 2 INTs) who Smith couldn't find enough compliments for in his Monday presser. The Illini have talent on defense for sure, but it's not going to be enough to disrupt the Michigan game plan. What else can I say about the Michigan defense that hasn't already been said? It's a defense that at the mid-season point is putting up numbers that if they can maintain throughout the rest of the season, will go down as not just one of the greatest Michigan defenses of all time, but one of the greatest defenses in CFB period. They're first or second in just about any statistic that matters, and it looks like the only other defense in the country that even compares is Alabama's brutal and merciless attack. If Michigan just executes the game plan, the Illinois offense will have trouble scoring much more than 10 points on Saturday.